There was a measure of wearisome predictability about the recent announcement of Zack Snyder as the director of the next Superman movie (provisionally-titled “The Man of Steel”). The man behind comic book adapations “300” and “Watchmen” beat out an array of idiosyncratic contenders including old hand Tony Scott (Spy Game), new hand Duncan Jones (Moon), Matt Reeves (Cloverfield) and Darren Aronofsky (The Fountain) for the coveted gig, due for release in 2012 and which will be overseen by current Bat-movie overlord Christopher Nolan. Initially, I indulged the fan snark like everyone else (“Okay, so the movie will be called “Superman: Exact Facsimile“…”; “I guess the flying sequences will have Superman fly really fast and then really slow for no apparent reason…“; “Will Superman’s abs be be CGI-enhanced…?”; “Will Lex Luthor be twelve feet tall for no apparent reason?”) and sure enough, the online reaction was as divisive as you’d expect. For one, Aaron Asadi at SciFiNow Magazine, whom I know to be a vested Superman fan, apparently left his critical faculties in that morning’s cornflakes, exclaiming that Snyder “has never made a good film. Ever.” – an opinion I would have cast as wilfully short-sighted and inveterately dumb if I didn’t suspect he was simply playing to the fanboy portion of his readership so as to prompt heated debate on the magazine’s message boards and blow away some of the tumbleweeds over there. Whatever, I think level-headed assessment ultimately indicates that Snyder is absolutely the right choice for this job – given the circumstances. While I will confess to having reservations about the man’s brand of filmmaking – he favours style over substance and can take fealty to source material rather too far, neither of which would lead me to rashly insist he’s never made a good film. (Come on, the man at least deserves huge props for actually making Watchmen the way he did…) – Snyder is quite clearly a gifted filmmaker, a visual stylist who have proven to be eminently capable of marshaling large, complex, effects-heavy film productions, which undoubtedly makes it easier for Warner Brothers to have the confidence in handing him control of a vast budget (ie $175m-plus). He’s a fast worker, which becomes a key consideration in light of Warner Brothers’ ongoing litigation with the heirs of Superman creator Joe Schuster (If WB doesn’t get a Superman film in production by the end of 2011, it will be very costly indeed). Furthermore, Snyder’s work on 300 and Watchmen highlighted only too clearly that the man respects source material – albeit to the point where there’s a danger of the final product being less a film and more a facsimile – which consequently gave him great credibility with the (very vocal) fans. With a property like Superman – and Comic Book cinema in general, I think – these are huge assets that it would have been foolish to ignore. Indeed: Snyder, I am quite sure, knows that the key reason why Richard Donner’s seminal 1978 Superman film worked so beautifully was because Donner and co. ardently respected the character’s mythology and this was reflected accordingly. Being the massive Superman fan that I am, there’s obviously a lot of things I hope for Superman: The Man of Steel – ensuring that they return Superman’s costume to its correct colours for one thing (the cape, boots and trunks are red, NOT maroon. It was one thing about Superman Returns I thought was needless tinkering for design’s sake). 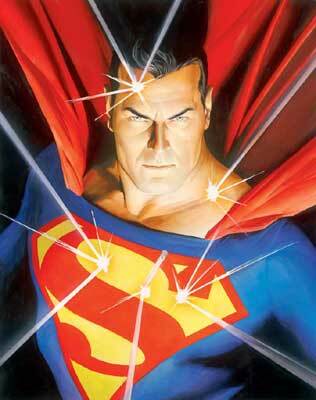 Most of all, though, is the maintaining of one element that still has a vast amount of potential: Mr. Brandon Routh. While I know enough about the film industry and the way it works to know realistically that the chances of Routh’s return to the role of Superman are slim-to-none, I think it needs to be noted that it would be a dreadful shame if, as is likely, he ends up as The George Lazenby of Superhero Movies. Whatever criticisms are levelled against Bryan Singer’s Superman Returns (2006) – and I think the biggest one is that Singer essentially made Richard Donner’s Superman: The Movie but with added soap opera and a huge dollop of melancholy – Routh’s portrayal of The Man of Steel was a very strong one. 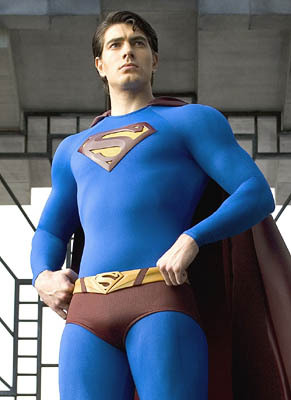 It certainly wasn’t Routh’s fault that the (good-looking) film built around him required him to not only channel Christopher Reeve’s peerless portrayal of Superman – a bloody tall order in itself that Routh pulled off with impressive aplomb – but also have him cowed by melancholy, regret, self-doubt and guilt. If – if– Routh were given the opportunity to headline a slam-bam Superman movie with a trulythreatening enemy – the word is that Snyder’s film will resurrect General Zod (although why not Brainiac? He is the quintessential cosmic villain for Superman) – then I fervently believe that Routh could shine in a way he simply wasn’t allowed to in Superman Returns. This won’t happen, of course. There will undoubtedly be another international casting call and you’ll get another early-to-mid twenty-something unknown donning the cape. However, given that this new production is quite obviously on the clock, why not forgo all that and save a load of time and money? You’ve got a great Superman ready and, as he’s said in many interviews, only too eager to have another crack at donning the cape. Anyone who’s seen the extensive video diaries that Bryan Singer created during the production of Returns– available on the US version of the 14-DVD set from a few years ago – will know that Routh put his heart and soul in to the role, regarding it as an honour and taking it very seriously, just like Reeve. That kind of dedication to such an iconic role, in my opinion, deserves – no: needs – to be capitalised upon. The one thing that Routh could bring to a reprise of Superman is a degree of maturity. Now aged 31 – and still looking great – he could play the character and actually look like he was an established figure. In Superman Returns, I couldn’t quite buy the idea that Superman had been active for nearly ten years. If – if– Routh did a trilogy now, he could bow out in his very early 40’s. Given that there’s been recent fantasy casting of Mad Men’s Jon Hamm – who’s 39 – as Superman, is it really such an outlandish idea? Routh has proven he can do it, he was widely praised for his performance, he has the support of the fans – what’s the downside? All Star superman has got to be the greatest rendition of superman “of alll time!” (300) – The guy had real depth, character flaws and the supporting cast were as good. Look for Christopher Nolan’s name in all CAPS on the trailer. After Begins, Dark Knight and Inception -this guy seems to know his movies- he’ll be quick to distance himself from the film if things go bad (with his reputation being praised like it is ATM).